Be enchanted and amazed by the famed above-ground tombs of Lafayette Cemetery, including the Interview with the Vampire, Double Jeopardy, and Deja Vu film sites. Highlights include the St. Charles Avenue Streetcar, the homes and former homes of Anne Rice, Trent Reznor, the Manning family, Nicolas Cage, John Goodman, and Sandra Bullock. Admire among many unique and diverse National Landmark architectural treasures the Short Villa with it's magnificent cornstalk fence, the death site of the Confederacy's only president, Jefferson Davis, and the site of Brad Pitt's film, The Curious Case of Benjamin Button. You and your guests will revel in the classical loveliness of the Louisiana Raised Cottage beauty Toby's Corner, the oldest house in the Garden District and home to Carnival royalty. Toby's Corner was the home of the overseer for the Creole plantation from which the district was carved. The Bradish Johnson House, now the Louise S. McGehee School for Girls, is one of our favorite stops. This Southern Reconstruction-era example of elegance departs dramatically from the white-columned confections one might expect! Built in 1872, and designed by architect Lewis E. Reynolds, it reflects the glory of the French Empire Style and is but one example of the magnificently diverse treasures you and your guests will marvel at in New Orleans' Garden District. 19th century American fashionable opulence and glamour describe New Orleans' historic Garden District. 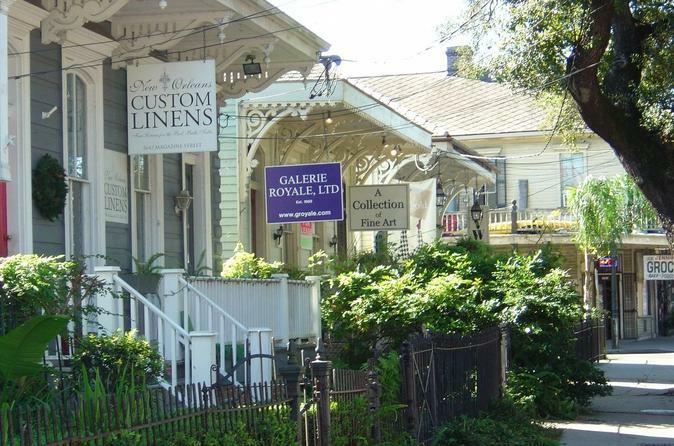 With its well-preserved collection of National Register listed mansions, pristine gardens and sumptious Southern charm, the Garden District stands out brilliantly as one of Louisiana's loveliest neighborhoods. It is a popular destination for visitors. Join us to enjoy the view even more! Special Offer - Travel by September 30, 2018 and save 20% compared to the local supplier's prices! - Book Now!